We have all witnessed numerous types of leaders: “hoarders,”,”ostriches” and “farmers.” It is farmers who ultimately get the real job of leadership accomplished. “Hoarders” hoard people in their departments or offices. When they identify excellent employees or potential leaders, their first question is: “How can I keep this person here as long as possible?” They focus on their own immediate needs and want to keep these potential leaders in the their place. Their strategic question is “how can this help me?” I remember how I used to see leadership this way. I wanted to look good, and saw excellent employees as vehicles to reflect on myself to peers and supervisors. Hoarders can be good managers; frequently, they know how to delegate well, they know how to utilize people’s skills, and they know how to get things done. However, hoarders are usually not interested in developing the skills and aptitudes of their best employees or in shaping these people to be future leaders. They tend to view career development by their subordinates as a threat to their own success, an obstacle to their own personal agenda, or as a hurdle to the long-term smooth functioning of their domain. Hoarders are not interested in the career development of staff members. They reason that such growth means they will move on to other departments within the organization or positions at other organizations. “Ostriches” are not smart enough to hoard their people. I remember moments in my leadership journey when I lacked self-confidence and I functioned in self-protective mode. I would keep my head in the sand. Ostriches don’t have the depth of vision to think about the development of their staff. They articulate the mission of their office and expect all staff members to contribute to the fulfillment of that mission and the accomplishment of departmental goals and objectives. Employees exist to serve the department. If they leave, they can be replaced. If they are interested in professional development or the cultivation of particular skills, ostriches may not stand in their way. However they will never sit down with employees and delve into their professional aspirations, asking how they can assist them in reaching their goals. The development of new leaders among the staff is simply not an issue on ostriches’ radar screens. The third group of leaders, the “farmers,” are different. These leaders grow people. People farmers maintain as a primary objective the development and success of their team members. In order to fulfill this role, people farmers plant the right individuals by engaging in a thorough, careful hiring process. They know that the hiring of any employee is a two-way street. There must be a match not just for the employer seeking to fill the position, but for the job applicant as well. Once these team members are hired, the people farmers nurture and cultivate them. Instead of fearing losing their employees, they actually help them articulate their personal goals and career visions. Then they develop methods for helping employees work towards those goals. In fact, the people farmers do everything they can to match people’s career aspirations with their job responsibilities, even if it means re-writing job descriptions, as long as such re-writing benefits the entire operation. People farmers know that their role is to put team members in positions to succeed, not to fail. They provide all employees, new and experienced, with the necessary ingredients to do their jobs well: desired results, guidelines, resources, accountability measures and consequences. They collaborate with all employees they supervise on the development of annual goals, including the identification of skills to be gained or improved upon or the knowledge to be learned. People farmers talk the talk and walk the walk – they role model what they want to teach their employees. They also seek help from their employees, admit their own mistakes, teaching that vulnerability and humility are strengths, and thus empowering their mentees to contribute and shine. They empower people to own their issues and to bring forward solutions. Farmers lead confidently through seasons, patiently feeding, pruning, tying, untying, planting, waiting, and harvesting. With sufficient nurturing and cultivation, these farmers experience the true joy of leadership: “people harvests:” – the development of their team members into new leaders. They also know how to let go. They expect to let go. On the day their people are ready to “leave the farm” and take on bigger responsibilities elsewhere, these farmers celebrate with them because they realize that these employees’ successes are their successes as well. In all my years of leadership experience, I have few regrets. One major one is this: I wish I would have listened to my “inner farmer” earlier and followed the calling. Hoarding people or burying my head in the sand may have helped me at the time, but these were leadership strategies based upon a lack of self-awareness and wisdom. For decades now, I have been focused on cultivating people, and have seen leaders sprout and grow into majestic trees in whose shade many, including I, I have found new strength and re-discovered the joy of authentic leadership. Have you ever been captivated by a story? So immersed that you felt like you were actually there? On a recent road trip with my middle school sons, I happened upon a story on the radio that captured us all. The story transported us — as humans, our brains are conditioned to listen to stories. Throughout history, information has been shared orally. Stories can be engaging and interesting to listen to, but they’re also powerful ways to convey information. People remember stories. When you’re preparing for your next meeting, consider including a story. If you have extraordinary data that you’d like to present, think of the detail behind the numbers. 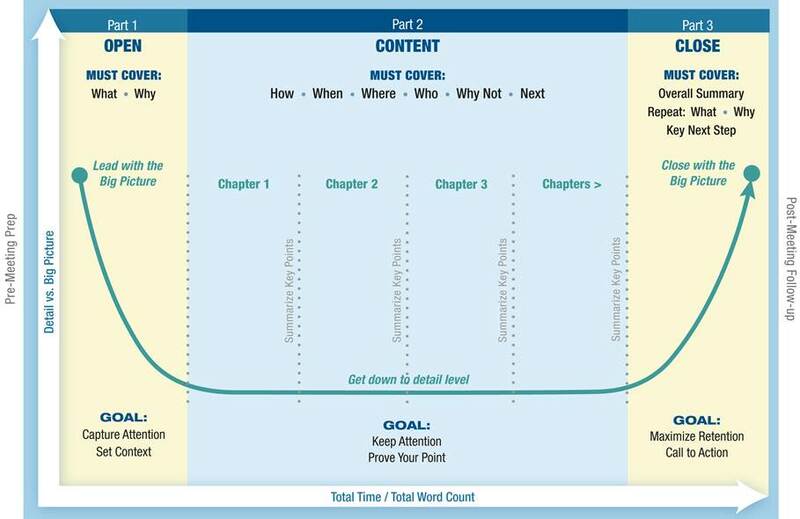 Can you weave a narrative for your audience rather than reciting from a spreadsheet? If you need to introduce yourself to a new group of people, instead of rattling off your resume, think of a short story that will demonstrate a little bit about who you are and what’s important to you. What’s your goal? What are you trying to accomplish? Be clear about your goal when you begin to choose a story. Think of the story themes to choose from. Scroll through the repertoire of experiences in your life and recall events that will demonstrate your message. Consider the impact: What will the audience remember? How will they feel? Will you inspire action? Determine the outcome you hope to achieve. Once you’ve outlined your goal, chosen a theme, and determined an impact, map your story using the Story Board Method. Practice it. Do a dry run with a colleague. And when you’re ready, try incorporating your story into your next meeting, the response may surprise you. Dean Brenner (C’91) is a recognized expert in persuasive communication, and is the founder and president of The Latimer Group, an executive coaching and training firm that that specializes in creating powerful communication skills. Dean and his colleagues offer coaching and training to a global client list of Fortune 500 companies. In addition, Dean has written two books on effective communication, and is currently working on his third. Dean lives in Connecticut with his family. To learn more about Dean and The Latimer Group, please visit TheLatimerGroup.com. For many of us, life will be full of successes, as well as setbacks, perhaps even tragedy. Because adversity is a fact of life, I believe a good part of living well involves cultivating resilience. In some cases, difficult experiences can even generate growth and transformation. When we move through hardship and reach the other side, we may discover in ourselves strength, courage, gratitude, compassion, perspective, and connection. Below are questions meant to stimulate your own thinking on the subject and to help you to develop resilience. But first, what is resilience? It is more than endurance or perseverance. After all, we can surmount hardship, only to break down after it is over. Resilience is an ability both to move through adversity and to preserve our capacity to continue to face all of life with its ups and downs. Although resilience is not a linear process, it may be helpful to think of it through the lens of time – past, present, and future – and to consider some of the elements that influence resilience within this framework. How we relate to the past?  Acceptance: Do we accept the hard truth of what has happened? Or do we avoid or resist it?  Interpretation: Do we interpret events accurately? Or do we tell ourselves that things will never get better, that the blame is entirely ours, that we are failures when we fail, or other falsehoods that erode resilience? How we experience the present?  Perception: Do we recognize that uncertainty and change are a part of life? Do we perceive our experiences as opportunities to learn? down or numb ourselves with distractions? family or friends we can celebrate with in good times and lean on in hard times? How we imagine the future?  Purpose: Are we able to find purpose in adversity, a focus greater than ourselves? imagination to identify other opportunities and our resourcefulness to execute them? Resilience can be cultivated through attention and practice. These questions can help you to notice how your thoughts, emotions, and behaviors affect your capacity for resilience and to identify areas that may require additional attention. Organizing some of the elements of resilience by timeframe may help you to see patterns that promote or erode resilience in your life and work. Reilly Davis is the Co-Founder and CTO of PeopleGrove, the platform on which the student-alumni networking platform Hoya Gateway is run. Your narrative is the most important thing you can present about yourself. I left a two-year finance program after only one year, and I was really nervous about doing that—how it would look and how it would be perceived. But, I learned that if I told my story in a way that showed I left the program to pursue my passion, people understood and were willing to listen. You can’t live your entire career not being flexible or trying to push forward with something that does not work. 1. Always having something new and exciting to work on and a new problem to solve. 2. Building a successful and enjoyable team culture. As a startup where we are doing everything ourselves, it’s vital to focus on building the right team in the right way and setting that team up for success. Continuing to perpetuate positive team culture and bringing on the right people is incredibly rewarding. My first job was in finance and investment banking, and I got into it because I didn’t know what else to do and because it was an easy path to take as a business school graduate. I wish I’d done more career and self exploration earlier. I always knew I was interested in startups and tech, but wish I’d talked to more contacts who could have given me the inside scoop and opened me up to that world earlier. My first startup was a mobile app that was basically Tinder for job hunting, matching job searchers with employers. We built and raised seed money from angel investors and hired good people onto our team. But, the app just did not work out. The hardest thing we had to do was to be honest with ourselves and our employees—we had less than $5,000 in our business account, and so we had to let some people go, and others stayed on to work with us knowing they wouldn’t be paid for at least a month. It is so important at a startup to recognize and to be honest with yourself when things are going wrong. That’s the moment when you have to make dramatic changes, or even to give up on the initial idea. It definitely is not always the glamorous startup lifestyle people imagine. Favorite professor or class at Georgetown? “Entrepreneurial Finance.” Every course was a case study of a startup, and by the end of the class we’d studied 20-30 different startups. Weekends with my roommates my senior year. I’d lived with basically the same four guys my whole time at Georgetown, and our senior year we lived off campus on Prospect Street. Some of our most fun nights weren’t spent hosting raging parties… instead we’d play Settlers of Catan. Being surrounded by good friends who were always up for hanging out was just the best. One of my very first entrepreneurial endeavors was at Georgetown: I ran a textbook buyback business. I learned the realistic challenges of business, why having a great team is important, and how to deal with regulations and restrictions (the university administration was not happy with me for competing with the bookstore). Georgetown also gave me a great network of classmates and professors who have helped to shape my experiences since leaving the Hilltop. One mentor, David Walker, helped me by opening up his own network to me and putting me in touch with some really helpful people. Our office is super tight, so we all have very tiny desks in a very collaborative environment. We’re surrounded by flags of the schools we partner with, which reminds us of why we do what we do. Though I don’t have a whole lot of space to spread out, it’s essential that I have what some call my “command center”: my ergonomic keyboard and big screen monitor. And, coffee and Red Bull are always on hand to keep our team going. I literally eat lunch at the same place every single day. I don’t waste time or energy thinking about lunch all day or trying new places. Who or what is a source of inspiration in your life? I recently married a double Hoya (we met in high school and went to Georgetown together), and she keeps me motivated by bringing perspective to my day. She’s a doctor, so hearing about her day forces me to pull my head out of the weeds and focus on things other than my job. She has incredible empathy for others, which is very inspiring. Eric Reese’s The Lean Startup is one of the most valuable books I’ve read. It’s important to find something that you are passionate about, that you want to work on, and to not worry about deviating from established paths. There are so many opportunities and roles to be created—forge your own path! Experience the PeopleGrove platform Reilly helped to build for Georgetown and join Hoya Gateway today to network with fellow alumni and current undergraduate students! Notably, subject matter expertise was mentioned infrequently compared to other practices. Although considered critical, subject matter expertise is seen as a threshold requirement for leading cases. One cannot serve effectively as a lead attorney without it, but mastery of the subject matter does not distinguish the really good lead attorneys. A second notable take-away from my conversations was the importance of consistency. When these practices are implemented consistently, teams perform better because they are able to focus on the work, with fewer bottlenecks and distractions. The transition from attorney to a lead attorney role can be challenging because an attorney shifts from doing the work to facilitating the work of others. The lead attorney’s success depends in large part on his/her ability to delegate effectively. Delegation done well can increase the overall performance and productivity of the team, accelerate attorney development, and even improve morale. Not surprisingly, a second practice of successful lead attorneys is communication. Three important areas – case development updates, next steps, and roles and responsibilities – were mentioned as key to better outcomes. Routine updates about case developments and next steps help team members understand the bigger picture and the context for their work. Discussing everyone’s roles and responsibilities with members of the team reduces duplication and facilitates coordination of efforts. In addition to delegating effectively and keeping everyone informed, successful lead attorneys routinely include the team in developing the case. This not only improves the work product by subjecting it to “stress tests”, but it also accelerates the development of team members by helping them to see how evidence and theories are developed. Another practice of successful lead attorneys is positive tone. This catchall category refers to a basic understanding that the lead attorney sets the tone for the team. Effective lead attorneys understand that their attitudes, emotions, and behaviors affect their colleagues’ performance, and they are able to manage themselves in a way that reduces distractions for the team and promotes engagement. The last practice demonstrated by successful lead attorneys is organization. Most of us understand that organization tends to improve the team’s performance by avoiding last minute rush jobs. We tend to appreciate less the connection between organization on the one hand and delegation, communication, and inclusiveness on the other. A well-organized case allows the lead attorney to assign “stretch” work to less experienced colleagues who may need more time to complete the task, and to hold regular discussions with the team. These five practices help explain why some attorneys are able to improve the overall performance of their legal teams and why so many of us seek them out.